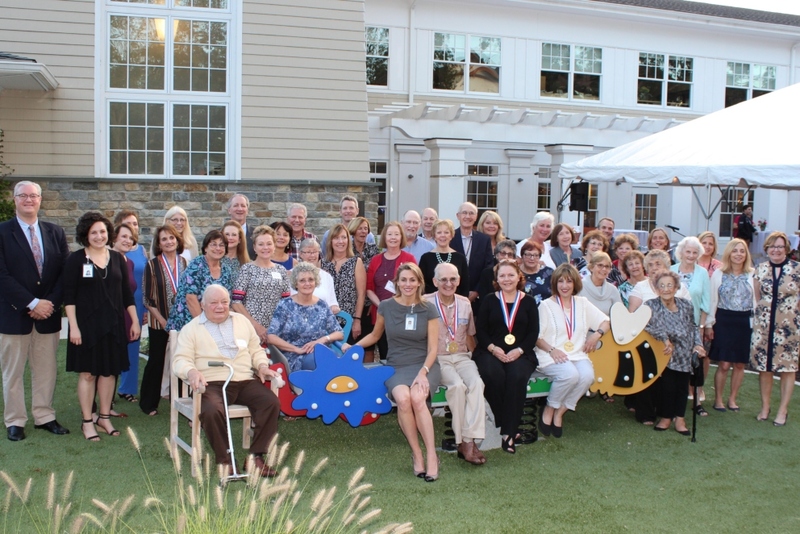 Danbury, CT – September 14, 2018 – In the midst of a stormy September week, the clouds cleared and the sun came out over the Memorial Gardens of the Center for Comfort Care and Healing just in time to celebrate 84 outstanding Regional Hospice and Palliative Care (RHPC) volunteers. These individuals earned the 2017 U.S. President’s Volunteer Service Awards (PVSA) for volunteering over 100 hours each over the past calendar year. This national award program recognizes and celebrates outstanding American citizens who positively impact their communities, while serving as role models. Now in its 35th year of providing care, comfort and compassion to community members at their end of life, RHPC recognizes their robust volunteer program as a touchstone of the hospice services provided. Each recipient was presented with a letter signed by President Trump, a heartfelt letter of gratitude from Roy, and a certificate commemorating the number of hours of service they provided. 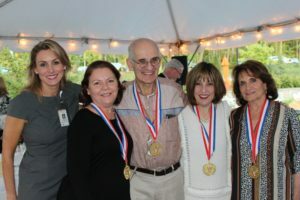 The eleven volunteers who provided 250+ hours of service in the calendar year also received a medallion, and the six who provided an astounding 500+ hours of service received an Olympic-sized gold medal. Director of Volunteer Services, Mary Beth Hickey, praised the group for their contributions to the agency, quoting Blessed Pino Puglisi: “If everyone does something, then we can do a lot.” She celebrated the exceptional volunteers for their kindness in “stepping up” to help others in need and not leading a life of apathy. Throughout the ceremony, applause erupted as each name was read and awards were presented to the honorees. They enjoyed a gourmet dinner prepared by the RHPC Chefs, followed by the agency’s signature cookies. PVSA recipients provided service to the agency as Family Support Volunteers, Lobby Greeters, Kitchen Volunteers, Flower Arrangers, Pet Partners, Reiki Practitioners, Administrative Volunteers, Fundraising Volunteers, Bereavement Volunteers and Healing Hearts Group Facilitators.